A reading from the gospel of John 14:1-14 (NRSV). Listen for God’s word to us. Little Ziggy is about to get baptized. A bundle of wonder, the adventure of his life unfolds before him! He’s been born into a loving family, with a great big sister, and parents doing all they can to provide for his every need – including his every spiritual need. In just a few moments he’ll be brought. Promises will be made – not just by his mom and dad, but by you all too. Until the day he’s old enough to claim Christ for himself, we’re doing it for him today. And every day hereafter he will be a brother of ours in Christ. It’s important that we remember that he’s not too young to be experiencing faith already. From the time we are born into this world, the nurture we experience from the adults of our world is our first experience of a loving God. To the extent that he’s surrounded in love by his family at home and his family of faith here, his trust of God is being formulated before he even has words to exclaim how amazing God’s grace feels! . . . Baptism days are big days for us all in the Church of Jesus Christ. . . . I hope we don’t forget what it first was like, when the Risen Christ’s followers underwent the sacrament for themselves. As the radical movement was spreading, people who had been raised according to other religious practices were drawn to the water. They were schooled in the message of the abundant love of God as shown to us in Jesus, the Christ. They were asked if they were ready – ready to enter into a new family. A new covenant community where they would walk with one another, helping each other not only to understand what this disciple of Christ thing all was about, but also to live as one initiated into the covenant. One engrafted into the group. They were entering – as is Ziggy today, as have we all at some point in our lives. Baptism is about entering into the Way of Christ. Episcopal priest Cynthia Bourgeault presents it beautifully in her book, The Wisdom Jesus. She reminds that Jesus isn’t just Savior. That is only part of his work among us – to save us from the cycle of our sins that can make life now a living hell. Western Christianity has emphasized this as Jesus’ role. Meanwhile, we’re discovering that the Eastern Church initially understood Jesus as Life Giver. As one who invited others unto the path of wisdom. Life Giver, Bourgeault writes: is one “whose life is full, integrated, and flowing. Jesus’ disciples saw in him,” Bourgeault explains “a master of consciousness, offering a path through which they too could become . . . enlightened.” Ones whose primary task on earth is to “put on the mind of Christ.” To live the Master’s way. (The Wisdom Jesus, Cynthia Bourgeault, p. 21). The gospel of John describes this way . . . the Truth that leads to Life. 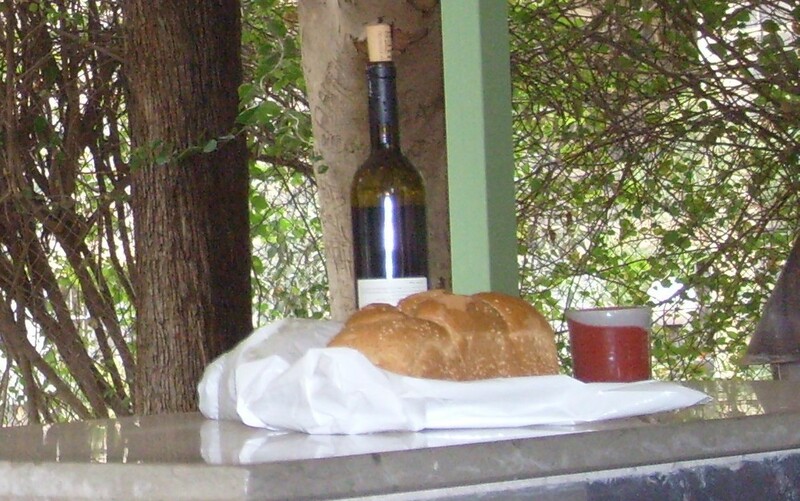 Jesus is desperate at the last supper with his friends to teach them that he is one with the Father. In him, the one laying down his life, Jesus teaches that the Father can be seen. One commentator writes: “In John, Jesus himself embodies the way to God and therefore the way of discipleship” (Feasting on the Word, Yr. A Vol. 2, Donald Senior, p. 469). His life, death, and resurrection show the path of how we are to be in this world – disciples of his who follow in like manner. . . . And what do we see when we look at him? He shows us that his way is the way of being so fully united with God that one is at one with God’s will for the world. It’s the only way, says Jesus the Life Giver, that we will find ourselves with God. . . . This is the way described right before this four-chapter Maundy Thursday monologue, when Jesus gives the new command to “love one another” (John 13:34). This is the way “by which all will know we are his disciples,” he claims, “if we have love for one another” (John 13:35, paraphrase). Thankfully, all are invited to this path. Everyone’s welcome to follow in the way of emulating our Savior and Lord, thereby finding ourselves saved. Given Life now and forevermore. It’s not the path that ends at the baptismal font. It’s the way that’s just beginning. As Ziggy grows, it will be up to his parents and us too to show him the way. To teach him how to use the personality, skills, and time he’s been given in such a way that his life is united with the One whom Jesus called Abba, Father. . . . Listen to the words that soon will be proclaimed at the font: “In baptism, God claims us, and puts a sign on us to show that we belong to the very household of God. . . . By water and the Holy Spirit we are made members of the church, the body of Christ, and joined to Christ’s ministry of love, peace, and justice.” . . . We’ll plead to God in prayer today that Ziggy will be “a new creation through these baptism waters” to “preach good news to the poor, proclaim release to the captives, and set at liberty those who are oppressed.” It’s a tall order for such a little guy. So we’ll ask God to “strengthen him to serve . . . with joy” until all is made new (PCUSA Book of Common Worship, WJKP, 1993; pp. 403-415). Before it’s all over, we’ll see the water on his brow and hear the proclamation that he is a child of the covenant . . . one to whom God will keep the promises made here today forever! . . . But this day is not just for him. It’s for us all too! In a moment, I will remind you to remember your baptism. To remember and be grateful! For you too are a child of the covenant, marked in your own baptism, no matter how long ago, as one who also has promised to follow in Christ’s way. To embody the path of Love for as long as you shall live. . . . It means we’ll get busy now – ensuring we too continue to grow in the knowledge and love of God. We’ll nurture one another and pray we’re strengthened always to live the good news. To embody in word and deed that the Way of God is the path of showing love to one another AND to those in this world who are in any kind of need. We’ll lay down our own desires to be united with God’s will for a world so deeply cherished. We’ll live as new creations serving with joy until ALL at last is re-newed. The light of our lives growing as we follow in the Master’s Way. . . . Brothers and sisters together, let us always give thanks to our Savior and Life Giver Jesus, the Christ who is the Way, the Truth, and the Life! This entry was posted in Sermons and tagged 14 May 2017 sermon, Baptism, John 14:1-14, Living the Way of Christ, The Life Giver, The Way, The Way of Christ, The Wisdom Jesus on May 15, 2017 by RevJule.